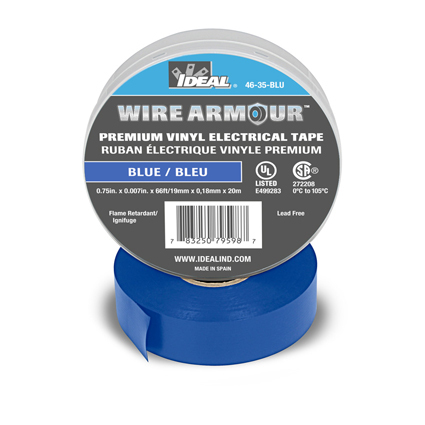 IDEAL Electrical launches its first line of premium vinyl electrical tapes, expanding their end-to-end solutions for customers. The first tape to launch, Wire ArmourTM, insulates and protects, stretches with strength and bonds when it matters. The new tape provides superior performance over a wide range of temperatures, including extreme weather, and boasts high elasticity, high UV resistance to water, oil, acids, etc. and is flame retardant. Wire ArmourTM is available in a wide array of colors including black, white, blue, orange, green, brown, yellow, violet and more. Additional electrical tapes will be released in coming months. As the Electrician’s Champion™, IDEAL Electrical is deeply committed to providing professionals, students and apprentices with everything they need to get the job done, end-to-end.